This is one of the most warming, delicious and comforting breakfasts I’ve had in a long time, it’s hard to believe it’s raw! I have to say this is foremost a simply wonderful Autumn breakfast and the fact it’s healthy, raw, vegan, blablabla is just an added bonus. Of course, I purposely made this a raw recipe but the results were so unexpectedly delicious that I think anyone would enjoy it. My family, who are certainly no health food freaks, tasted some and loved it too… they were shocked when I told them what was in it! The chia seeds are the star of this recipe, when blended with a liquid, they create a very thick, gel-like consistency. 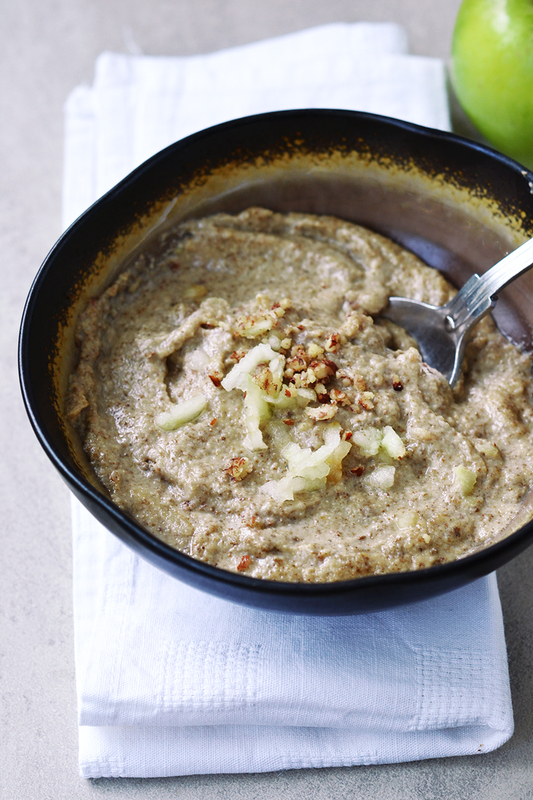 The almond butter adds further bulk and texture along with a wholesome, nutty flavour. Both create a familiar porridge-style mixture. And just because it’s raw, doesn’t mean it’s cold! I think, for a lot of people, one of the most off-putting things about going on a raw diet is missing out on warm meals, especially in the Winter. But just because the food isn’t cooked, doesn’t mean it can’t be warmed up. So this porridge has been gently heated to about 40°C to make it nice and warm without destroying nutrients. Chia seeds are by far my favourite superfood <3 I often use them to thicken smoothies or even as an egg-replacer but the great thing about them is a little goes a long way, making them a frugal superfood. A delicious, warming breakfast that just so happens to be super healthy for you! Suitable for raw, vegan and gluten-free diets. Mix all the ingredients, except the chopped nuts, in a blender until thick and smooth. Serve with chopped pecan nuts and grate over some fresh apple (I used leftover apple from the core.) Enjoy! Haha I'm so pleased you're enjoying it! Thanks for the lovely comment. Love this!! It has around 500k cal (without nuts or sugar) if anyone is counting. I will definitely leave the apple unpeeled next time. Hi If we have nut allergy what can we substitute the almond would? I have just gone back to eating no carbs and very low sugar. I was craving "oatmeal" today and found your recipe. I just made it. I didn't add dates (didn't have them) or coconut sugar. I also left the apple unpeeled. When finished I topped it with a few blueberries and a payback of grass fed butter. It was SO delicious and filling. I even had a bit left over that I can warm tomorrow. Thank you for this recipe! Had this for breakfast this morning. Although I didn't blend it, it was amazing and I wasn't hungry until tea time. Thank you! great recipe! i left the apples unpeeled for more fiber and it absolutely works. I saw your instagram photo and loved the shot! Thanks so much for sharing :-) Glad you enjoyed it! Do you think you could make larger batches and store in the fridge for a few days and just eat a bit each day? Hi Michelle, I'm not sure to be honest. I suppose it could be kept overnight but it might thicken a bit and I'm not sure how well it would last beyond that point. Let me know how it goes! Hi, I just love this recipe! I'm trying to get my five-year-old to eat healthy food and cut down on grains and dairy, and this porridge ticks all the boxes! As he sometimes leaves a bit, and I find it a waste, I've started making muffins from the leftovers - obviously they're not raw anymore, but still vegan, grain free and dairy free. I add as much buckwheat flour as I have porridge (normally 1 - 1.5 dl more or less), 0.5 dl vegetable oil/melted vegan butter, 0.5 dl coconut sugar, 1 chia egg, 0.5 tsp baking powder, 0.5 tsp baking soda and a splash of vanilla extract. Bake in 180 degrees for 15-18 minutes. Makes 10 smallish muffins that are yummy and healthy! I've tried adding raisins as well as blueberries - both work great, as would choc chips I'm sure! Thanks for a great recipe! Oh this looks amazing, I have to try this! I tweaked how I made the recipe to work with my allergies and what I had on hand, but regardless this is a very good recipe that satisfied my porridge craving. I used coconut milk and cashew butter since I'm allergic to almonds, and added 1/4 cup cooked quinoa at the end. Thanks for sharing! This wonderful dish would be lovely for Christmas morning brekkie! Thank you for sharing. Good thinking for the Christmas brekkie idea... 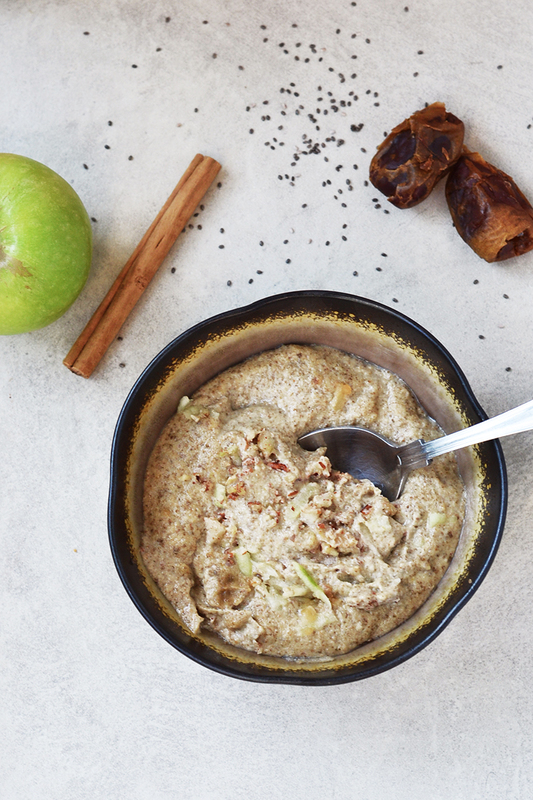 I absolutely love this porridge, I hope you get to try it and enjoy it too :-) Let me know how it turns out if you do! Hi Aimee My boyfriend Anil pointed me to your blog as I often cook gluten-free. Just enjoying a bowl of buckwheat porridge inspired by your recipe above! As I wanted something more grain-based I soaked some buckwheat flakes and chia seeds in water, then blended a paste with some apple/ a little almond butter/dates/almond milk which I mixed into the buckwheat and warmed. Topped with a few blackberries and cinnamon - autumn is here! Want to try your blueberry lavender porridge too. Hi Hannah :-) Is that Anil BC? He is the coolest! I love the sound of your autumnal inspired breakfast, especially the addition of blackberries... I have a ton of them stocked in my freezer so I will add them next time I make this porridge. Let me know what you think of the lavender porridge if you try it! Hello ABC & Hannah :-) Ah, I'm so glad you tried the lavender one - it's one of my favourites but everyone I mention it to says "yuck! LAVENDER??" - give lavender a chance, people!! I just had it thismorning with 1/2 banana instead of dates. I added coconut oil because it should he in everything. My son and I thoroughly enjoyed this. Aren't chi's seeds wonderful? It had a really good texture too, like porridge. I am going to make this often since I really miss warm morning oatmeal and cream of wheat and wont ever eat those things again. Thank you thank you! I must try this for breakfast next week! Planning on it, thank you! This looks utterly delicious Aimee. It's early spring where I am and we are still getting cool mornings, perfect for a bit of Apple Pie Porridge for breakfast. Thanks for the recipe. This looks SO good! I remember when I was a kid, my dad would leave some warm porridge for me and my siblings in the microwave before he went to work. It was so comforting waking up to that in the morning. Ever since then, I haven't had porridge. I need to make some again soon! This porridge sounds so good! I never thought to try it with almond butter but it's such a great idea. I'm definitely going to make this. Well, being in England, you can imagine it's already pretty cold over here now. But I actually love the cold weather, because I get to eat warm porridge for breakfast! I've been so into gorgeous fall porridges lately and this bowl is so beautiful! 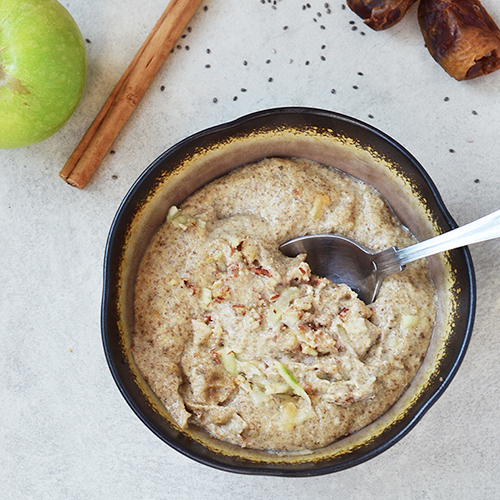 The apple pie porridge sounds scrumptiously tasty and fresh! What a great treat! We're just starting to get cold here and porridge is now going on daily rotation. Me too, just switched to porridge this week. It's the only thing to get me out of bed on a cold morning! OK I really need to make this again now! I'll make any adjustments afterwards :-) Thanks so much for your feedback Helen!